Photo courtesy of Haute Baso. The CEO of the Rwandan label speaks on the mission of the brand and the importance of investing in young talent. Style Dimension is OkayAfrica's seven-part series highlighting emerging designers from Africa and its diaspora. Along with giving you a glimpse of each designer's stunning work, this series is an introduction into their creative realm. In the fifth edition of the series, meet CEO of Rwandan brand Haute Baso, Pierra Ntayombya. While fashion is often seen as a tool to push pop culture trends, there's not much focus on utilizing design to uplift and create economic independence for people in low income communities. 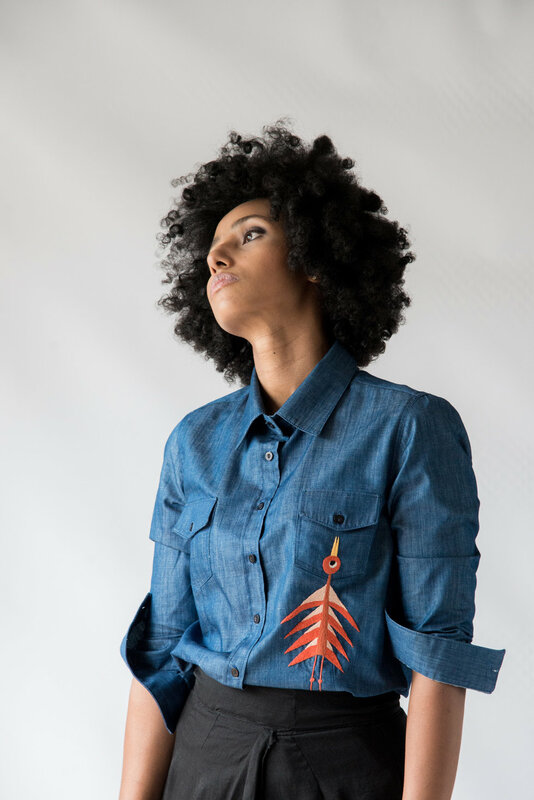 On the other hand, Rwandan label Haute Baso recognizes the value in ethical fashion and creating ready to wear pieces characterized by elements of traditional African craftsmanship. CEO Pierra Ntayomba, who handles operations of the brand founded by Linda Makungoga in 2014, expresses how the brand recognizes the potential of young women by offering them training and employment—an investment that creates skill development at a fair wage and within a safe working environment. Most of the women working with Haute Baso are the sole breadwinners of their households. The partnership with the brand enables them to feed, educate, and provide healthcare for their loved ones, which ultimately reduces the long-term cycle of poverty associated with many African countries. The brand has worked with 275 artisans in Rwanda so far. Haute Baso's current collection is inspired by Rwanda's vibrant and timeless culture paired with sustainability, technology, modern design and comfort.Through their pieces, they utilize traditional skills such as basket weaving and embroidery in their relaxed, cross-seasonal looks in an innovative way. Their commitment is to make accessible clothing that is stylish, simple and builds confidence in their buyers. I spoke with Pierra Ntayombya about Haute Baso's goal as a brand and how they want to shape change using style. Amarachi Nwosu for OkayAfrica: How does your African heritage shape your approach to design? Pierra Ntayombya: Our African heritage is rooted in community and collaboration which are central to how we design and produce each piece. We work with primarily female led cooperatives to develop and produce each piece—as the saying goes, it takes a village. What are your thoughts on the current landscape of the fashion industry in Africa? Do you think the industry is evolving quick enough to creatives who want to build global brands? There's a shift in the current landscape in African fashion where the aspiration to be a global brand meant successfully entering the Western market. However, today we are seeing a new focus on servicing the gaps in the continental market. This current landscape is encouraging, however, there is still a substantial opportunity to improve the infrastructures across the continent to ease the exchange of goods and service, allowing for the African fashion industry to reach the global level. How are you actively trying to change norms or evolve the industry and African narrative through your brand? As a brand, it is part of our design ethos to highlight the functionality and versatility of traditional African skill sets. Our narrative is driven by a transparent value chain to highlight the talented artisans and cooperatives that collaborate with us with an intentional investment into up-skilling. The fashion industry can seem like an "exclusive club" which can only thrive if we share and invest in young talent, and stretch ourselves beyond just using Kente or African prints. What advice would you give to other young designers? To other young designers, I would encourage them to consider collaborating in any way they can. As there is strength in numbers, with collaboration many challenges faced by African designers such as logistics, sourcing and production can be eradicated with collaborations across the continent. Keep up with Haute Baso on Instagram.